South Sudan rebel leader Riek Machar has returned to the capital of his war-torn land for the first time in two years. 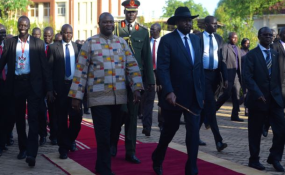 Machar arrived Wednesday morning at Juba's airport from South Africa to attend a ceremony hosted by his longtime rival, President Salva Kiir. The two men signed a revitalized peace deal back in September aimed at ending South Sudan's nearly five-year old civil war. Machar served as Kiir's vice president after South Sudan won independence from Sudan in 2011, but a power struggle between the two triggered fighting between forces loyal to both men. Kiir and Machar have reached several accords since then, but each deal has failed, including the last one in 2016 that forced Machar to escape a new round of fighting in the capital. Under the new pact, Machar will serve as the first of five vice presidents under a transitional government of national unity.